How to add code to existing article (Using Improve Article)? Prerequisite : How to Improve an Article ? Click on “Improve Article” button present at below of each article. This is one of the three buttons below the article’s tag. Other than adding code, modifying content of article must be avoided. 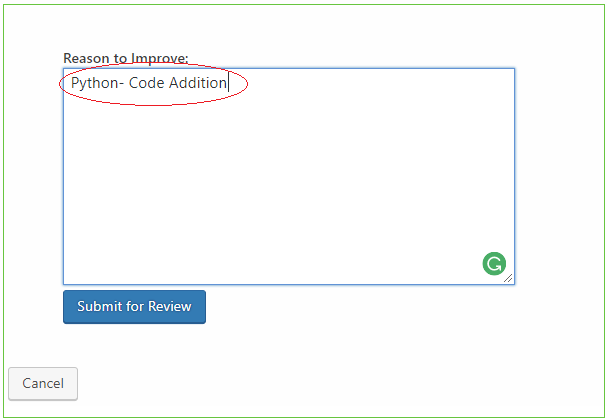 Mention ‘LanguageName – Code Addition‘ in Reason to Improve box and submit for review. The codes in multiple languages are added using below tags. To add your code, please add appropriate tag and write code between the tags (Please note that, we need to keep existing content as it is and add our code with appropriate tags). If &lsqb;tabby title=”C++”] and &lsqb;tabbyending] are not already present, then you need to add &lsqb;tabby title=”C++”] for existing code (if existing code is in C++) and one &lsqb;tabbyending] at the end. Variables used in the code, program structure and output should match with the existing code. Please add following comment at the bottom of your code. Variable names and output of newly added code (for example Java) should be same as existing code (For example C++). It is strongly recommended to refer general coding guidelines when adding code for any language.